The following steps describe how to uninstall Office products on a PC (laptop, desktop, or 2-in-1). For Mac, see Uninstall Office for Mac. Tip: Uninstalling Office only removes the Office applications from your computer, it doesn't remove any files, documents, or workbooks you created using the apps. The steps to uninstall Office depend on the type of installation you have. The most common installation types are Click-to-Run and Microsoft Windows Installer (MSI). The other type is an Office installation from the Microsoft Store app. Select the Click-to-Run or MSI or Microsoft Store tab below and follow those uninstall steps for your installation type. Not sure which type of install you have? Note: If you can't open an app to check your installation type, try the more common Click-to-Run or MSI uninstall steps first. Create or open an existing file and select File > Account (or it might say Office Account). Click-to-Run installations have a Version and Build number, and include the phrase Click-to-Run. Follow the Click-to-Run or MSI steps below. An MSI installation doesn't have a Version or Build number. Microsoft Store installations have a Version and Build number, and include the phrase Microsoft Store. If you have this installation type, select the Microsoft Store tab. If you have a Click-to-Run or an MSI installation, uninstall Office using the Control Panel or download the uninstall support tool. If you can't uninstall Office using either of those options, try uninstalling Office manually. Tip: If you installed the Office apps as part of a suite, such as Office Home and Student or Office 365, search for the suite name. For stand-alone apps search by the app name, such as Project or Visio. In most cases you can't uninstall an individual app if it's included in your Office suite. The only way to uninstall an individual app is if you purchased it as a stand-alone app. How you open the Control Panel depends on your version of Windows. Select Programs > Programs and Features, then right-click your Microsoft Office product, and choose Uninstall. Select Programs and Features, then right-click your Office product, and choose Uninstall. Follow the prompts to complete the uninstall. Note: If Office isn't listed in the Control Panel you could have a Microsoft Store installation type. Select the Microsoft Store tab above and follow those uninstall steps instead. To reinstall Office select the version you want to reinstall and follow those steps. Follow the steps below to download the uninstall support tool according to your browser. Tip: The tool may take a few minutes to download and install. After completing the installation, the Uninstall Office products window will open. At the bottom of the browser window, select Run to launch the SetupProd_OffScrub.exe. In the lower-lower left corner right-click SetupProd_OffScrub.exe > Open. In the pop-up window, select Save File. 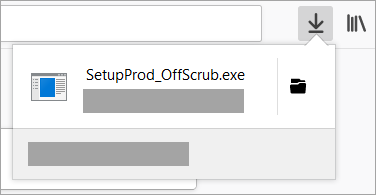 Next, from the upper-right of the FireFox browser window, select the downloads arrow and then select SetupProd_OffScrub.exe. Select the version you want to uninstall, and then select Next. Follow through the remaining screens and when prompted, restart your computer. After you restart your computer, the uninstall tool automatically re-opens to complete the final step of the uninstall process. Follow the remaining prompts. Select the steps for the version of Office you want to install or reinstall. Close the uninstall tool. If the Office unistall tool doesn't completely uninstall Office from your PC, you can manually uninstall Office. Select Start > Settings > Apps. Under Apps & Features select the version of Office you want to uninstall. Note: If you installed an Office suite such as Office Home and Student or you have an Office subscription, search for the suite name. If you bought an individual Office application, such as Word or Visio, search for the application name. Tip: If you can't uninstall your Microsoft Store installation using Settings in Windows 10, then try to uninstall Office manually using PowerShell following the steps below. Right-click Start and select Windows PowerShell (Admin). This takes a few minutes. Once it's done, a new command prompt appears. If only a command prompt appears and no additional information, it means you successfully removed Office and you can close the Windows PowerShell window. To reinstall Office see Install or reinstall Office on a PC. However, if your device is running the Windows 10 S operating system, you'll need to reinstall Office from the Microsoft Store. Note: If you're not sure what operating system you have, see Which Windows operating system am I running?